Every cat owner needs to provide essential cat furniture for their pets to provide a comfortable living setup for them. One of the most basic and necessary furniture that you can provide for them is a cat window perch. If you study a cat’s behavior, you will notice that it likes to establish its territory by climbing or exploring. Their attention is easily caught by movement or activities within their direct surroundings. You must also provide the same opportunities with cats that live indoors. Hence, a cat window perch makes great sense so they can maintain a healthy lifestyle, as much as those that live outdoors. With a suitable living setup, you can extend a domesticated cat’s lifespan to as much as 20 years. To help your cat to overcome a sedentary lifestyle, you need to provide as much source of activity as possible. 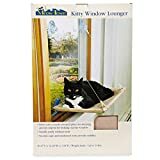 This is when cat window perch serves an additional benefit since they can engage in a lot of physical activities and relieve boredom. Life in the indoors can provide lots of limitations for your pet cat. In some cases, it could result in damaging or destructive behaviors. This is because you do not typically walk cats as much as with dogs, which is very beneficial to maintain their health and vitality. When it comes to controlling their behavior, buying a cat window perch makes great sense. Instead of punishing them for expressing their natural behavior, you can provide them an individual space where they can vent those behaviors without causing damage to any properties inside the home. The following includes four types of cat window seats or perches top in the market based on customer reviews and prices. If you maintain your windows clean and you protect the suction cups, this bed comes first on the list at ease of installation, weight capacity, relocation, and cleaning. owners complain having to support the Velcro with a stronger Velcro. Velcro adhesive damages some window sills during removal. One thing that is constant among the window perches is that cats love them. The products differ in price, relocation capabilities, ranges of weight and installation, therefore be sure to get a present weight on your pet cat(s) before you order a new window seat. Also, keep in mind the measurements of your window and remember the size, features and installation procedures of a window perch before making a purchase. If you don’t like attaching materials to your windows, always look out for a tower positioned near a window to ease visibility. Buying a cat window perch with numerous levels is highly suggested, which enables your pet to expend their energies on. Therefore, buying this particular furniture proves to be a necessity for pet owners because it does not just provide a safe haven for their feline pets, but you get more organization at home and lesser furniture damage. 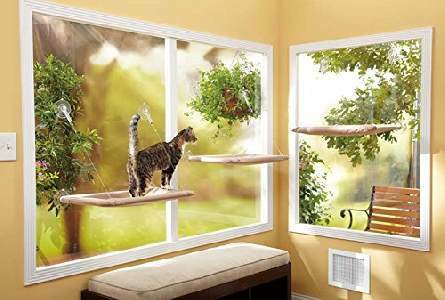 For your pet cats, your window serves them the same purpose, to get light and air. However, these cats would truly enjoy the ambiance outside and would like to get some heat from the sun. If you can notice, they would more often like to wait and stare outside the window more than you do. 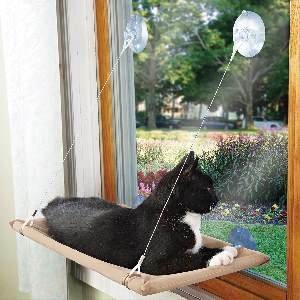 So why not make or construct a cat window perch for your feline so that your cat can stay comfortably at the window. 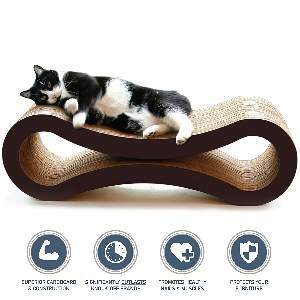 Some would prefer to build this cat seat by themselves, but you can also purchase them from pet stores together with other accessories that you can use for you cat. 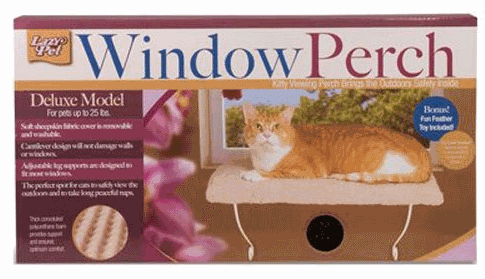 These window perches for your cat are not that hard to install at all. If you are to purchase them from a pet supplies provider, you will have a variety of options and designs to choose from. However, finding the right cat window perch may be a bit challenging for you. 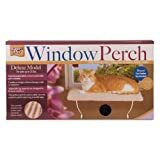 A cat window perch can match into many windows sizes because of its adjustable features. The fabric used for the seat can range from a variety of comfortable fabrics which you think your feline would peacefully rest on while gazing outside the window. You don’t need to bother yourself much about purchasing one from time to time because the bedding and the cover of this perch can easily be washed to your preference. You may find various models or designs of these feline perches such as the heated cat window seat, Thermo cat window perch, and other designs which can give comfort to your cat like seats which resemble a hammock. 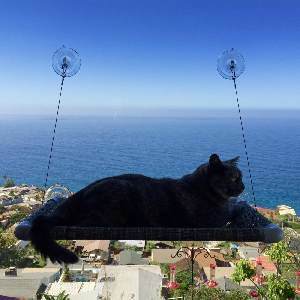 You may opt to purchase feline window seats which are cheaper but you also have to check the quality of these cheap seats before purchasing them. Since there are a lot of options when it comes to shopping for such cat supplies, try to compare before spending your money them. To conclude, Cat furniture like cat window perch is essentially made to address your feline pet’s instinctual behavior. Plus, it enables them to combat stress since they too experience those as much as humans. You can also promote overall well-being by enabling them to do activities that they enjoy. Cats naturally desire to be situated in elevated areas where they can look outdoors and observe. The best spot for this is in the house’s window, which also makes it easier for them to climb trees. This particular furniture enables them to encourage this natural behavior and nourish it.